Highly desirable but of unknown origin. Some collectors feel these are more art glas than Carnival. Because of the aqua opal color, a good possibility is Northwood. 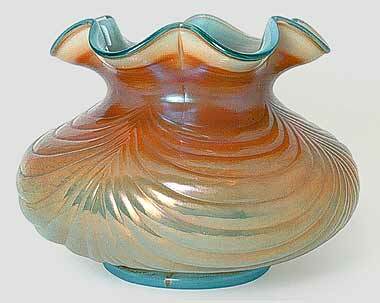 This one in aqua opal sold in 2001 for $5,000 and again in 2012 for $7,250. Another in aqua opal and one in green are known. In 2009, one described as vaseline sold for $1,600. The only known green example sold in 2014 for $1,400.